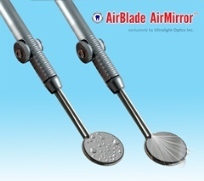 The AirBlade AirMirror is designed to eliminate the need for dental assistants to clean the mouth mirror with an air/water syringe during procedures. The AirBlade AirMirror connects to all quick-connect air supply port and uses an air jet to clear water and fog from the surface of the mirror. A thumb knob valve allows the clinician to fully adjust the flow of air. The system comes with four mirrors, four handles and two quick disconnects (quick disconnects are available in all sizes). 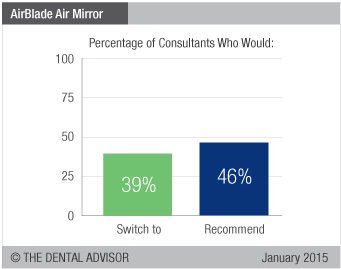 AirBlade AirMirror was evaluated by 13 consultants in 320 uses. This mirror received an 83% clinical rating. 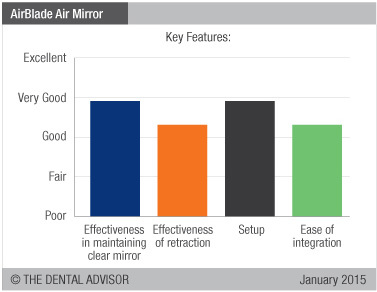 AirBlade AirMirror gave more than one third of consultants significant time savings during treatment. 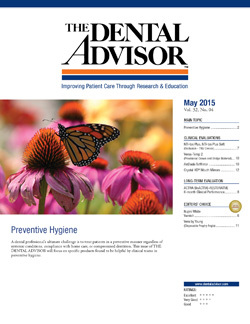 Having the mirror constantly clear allows quicker treatment and frees one of the dental assistant’s hands. It was reported that water was cleared effectively from the mirror surface. The airflow knob is sensitive and moves at a light touch to allow full control over the air. Consultants also discovered the air jet cleans the debris and water from the preparation and margins, resulting in extra time savings. The advantage of always having a clear mirror is worth having the lightweight air hose connected to the mirror. Adjust to the minimum airflow necessary for maximum comfort for the patient.